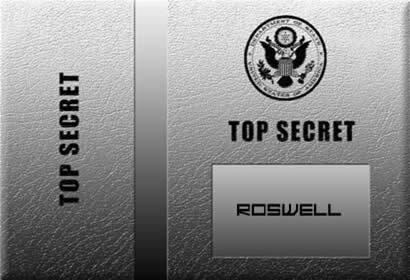 For years people have asked why would the U.S. government have become actively involved in a cover-up of the Roswell 1947 UFO crash (and possible recovery) of living/dying/dead extraterrestrials. 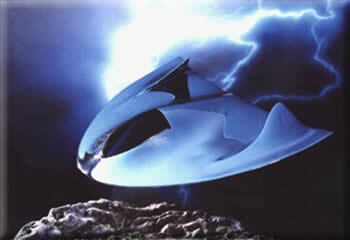 Why for that matter should there be UFO cover-ups of any kind? While the National Security Agency claims that the deletions in its above top secret affidavit relate solely to the protection of its intelligence-gathering capabilities, this is most certainly only half the truth. Since 1946 it must have been clear to defense intelligence chiefs studying the so-called GHOST AIRCRAFT wave in Scandinavia and elsewhere that intelligently controlled objects of unknown origin and purpose were operating in our atmosphere! Even as early as 1942, when mysterious objects appeared over Los Angeles, General George Marshall, as Army Chief of Staff, was unable to account for the sightings in conventional terms. So, by July 1947, when sightings proliferated throughout the United States, and a UFO crashed at Roswell, New Mexico, it must have become obvious, to some, that the FLYING SAUCERS were of extraterrestrial origin. Apart from the likely fact (it was believed by the "authorities") that an admission to this effect would generate public alarm, the military (one can reasonably speculate) needed to learn as much as possible about the construction and propulsion of the craft, in the event that another nation (primarily the Soviet Union) might acquire this knowledge first, providing an additional reason for having total secrecy attached to the investigations. Independent researcher Wilbur Smith learned in 1950 from a Dr. Rob Sarbacher that the stories of recovered DISKS were true, and that a small group---most likely Majestic 12--- was headed by Dr. Vannevar Bush in order to learn as much as possible about the modus operandi of the so-called saucers, and only those with a "need to know" were to be informed of the findings. It would seem logical to conclude that an intelligence matter classified two secrecy levels higher than the Hydrogen-bomb is unlikely to be revealed except to those with the very highest security clearances. Even at that level, the degree of information shared would be kept severely compartmentalized. In other words, those who learned the "truth" about UFOs did not necessarily know the WHOLE TRUTH, nor all of those who had the same level of saucer/alien knowledge as they did. The old fable of the blind men describing an elephant comes to mind. Former Air Force pilot Lieutenant Colonel Donald Ware shares this opinion. He believes that by 1947 (following the Roswell incident) the top military authorities had concluded that some UFOs were extraterrestrial. They would then have realized, he says, "that if our enemies acquired the technology represented by these vehicles before we did, our security would be severely threatened. Information on such technology must receive the most extreme protection." Although there have been at least forty accounts of UFOs alleged to have been recovered throughout the U.S. and elsewhere, the evidence suggests that it took a long time-possibly several decades-before we could even begin to comprehend the alien technology. To once again quote Stanton Friedman, "You might have handed Thomas Edison one of today's pocket calculator forty years ago, and there's no way in the world he could have figured out how it worked." No government is happy to admit that alien vehicles invading the airspace can come and go as they please, and that our defense against them is inadequate. That some UFOs have been responsible for the destruction or disappearance of their aircraft is not something that could be admitted openly. Nobody likes to look silly. Fear of ridicule can be a very compelling reason for the military and politicians to debunk UFOs, especially if they don't have access to all the facts. Very few politicians in the United States, England and worldwide, have the faintest idea about the subject, which is why their repeated statements debunking all the reports are so convincing. And those few who have troubled to study the matter may be so bewildered and even alarmed by the awesome complexity of the phenomenon that they would rather say nothing at all. 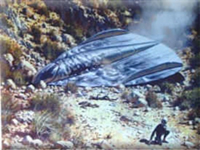 In 1964 Ray Stanford discovered metal fragments at a site in Socorro, New Mexico, the same site where Sergeant Lonnie Zamora encountered a landed UFO and its occupants in 1964. Stanford and colleagues took the samples to NASA's Goddard Space Flight Center where preliminary analysis determined that the metal shavings were highly unusual: so unusual, in fact, that they were promptly confiscated. Later, Stanford and Robert McGarey had the opportunity of discussing reasons for the cover-up with a US Navy captain, who in rather over dramatic terms offered his opinions on the matter. "You had no right to that kind of dynamite," he said. "What do you want to do? Blow up the whole economy, the entire social structure, and every other institution worth keeping?" The captain continued: "Those in a position to know are under no delusion. They know the facts. People are not ready to know the facts, and they have no NEED to know them. They could, half of the people maybe, go off the deep end." Stanford asked if those IN THE KNOW cracked up on learning the facts. "I doubt it," he was told. "But, those men are trained to accept and meet crisis. They are capable of rational judgment in the face of the unexpected...Their decisions are based on experience and discernment that the average man, even the UFO researcher, never has." It is unlikely that the fabric of society would be destroyed if selected facts were released. Once the initial disbelief, there would certainly be widespread concern as to the alien visitor's motives, disturbances on the stock market, but also a great deal of excitement and perhaps a new look at of our role in the universal scheme of things. If such an announcement were made, Stanton Friedman believes, "the stock market would go down, mental hospital admissions and church attendance would go up, and there would be an immediate push on the part of the younger generation---never alive when there wasn't a space program---for a whole new view of ourselves; not as Americans, Chinese, Canadians, Israelis, etc., but as People of Earth. There isn't any government on this planet that wants its citizens to owe their primary allegiance to the planet, instead of an individual government. Nationalism is the only game in town." Public reaction to an admission by one of the superpowers that some UFOs are extraterrestrial would hinge on how much we are told, and this would present our leaders with an major dilemma. Such an admission would lead to a an avalanche of questions, some of which simply can't be answered without disclosing vital defense interests; alarming cases of missing aircraft, abductions, genetic experiments; and bizarre cases that may remain beyond our collective comprehension for centuries to come. Like the "X-Files" says, "The Truth is Out There." The effects on the economy and politics are worth considering. "Every nation is concerned about the effects on worldwide economies and political structures if the world were to be in touch with aliens with a different technology, " Stanton Friedman believes. "Is the oil in the ground now worthless?... Would the big shots of today be deposed tomorrow? The best policy is to hope that the aliens go away or that contacts and shaking up of earthly society happen during the next administration's reign." "...Implications for the National Security are of continuing importance in that the motives and ultimate intentions of these visitors remain completely unknown.... It is for these reasons, as well as the obvious international and technological considerations and the ultimate need to avoid a public panic at all costs, that the Majestic-12 Group remains of the unanimous opinion that imposition of the strictest security precautions should continue without interruption into the new administration."